Inspired once again by the untouched wilderness of Mongolia, Christopher Raeburn‘s vision for AW16 was ruggedly masculine. In hues that reflected the Mongolian steppes and the traditional dress of those who inhabit it, this sturdy collection was also well suited for such environment: classic menswear and miltary staples reinterpreted by Raeburn‘s unique creative vision to form his most wearable collection to date. We particularly loved the deep red duffel coat with matching chunky scarf, neat bomber javkets, the cheetah sweaters, ‘camouflage’ bags that matched the outerwear, and the footwear; part of Raeburn‘s continued collaboration with British footwear brand Clarks; roll on February (launch date)! Raeburn in his still young career has become an institution to many of the fashion pack, and amongst men in general his sustainably crafted menswear has quickly garnered cult following. It is not hard to see why: his signature parkas and ponchos, chunky knits and his collected animal ‘totems represent for many the great adventures of old, tales and stories we grew up on as boys and still hanker for now as men; we alll wanted to be Mowgli or Scott of the Antarctic, and for most of us Christopher Raeburn is as close as we will ever actually get! Ever wondered what it takes to dress the Duchamp way? Well you’re in luck as this season the intrepid brand has launched a collection founded on their fundamental dress codes for the London man. Winter Florals, Creative Business, Tonal Layers, Innovative Textures and Artistic Features outline the five key elements to creating the cardinal Duchamp look. Printed silk shirts, woven cocktail jackets and contemporary wool suits set a precedent for an ultramodern and artful take on traditional city wear with a reassuring palette of tonal colours from rosewood to light azure blue. At it’s core, the collection plays with the idea of contrasting components; layering clean cottons with dense, woolen jackets and pencil sketch prints with bold graphic stripes, the innovative and diverse range of fabrication and texture allows for a novel approach to cultured tailoring. Renowned for their directional approach to menswear, AW16 sees Duchamp step up their design philosophy to reflect the spirit of now and the lives of modern, city men. Chester Barrie suffused an air of Hollywood’s golden age for AW16 as timeless looks become artfully updated with a rush of modernity. Held at the idyllic Waldorf Hotel in Aldwych, the ultimate modern tailor brought serious red carpet glamour in reverence of the best-dressed men to ever grace the silver screen. Integrating traditional craftsmanship with a contemporary eye, Chester Barrie creates a collection bound by woven cloths, luxury detailing and rich, sumptuous textures. Definitive pieces including the classic dinner suit and cocktail jacket are lavishly updated with navy silk and sumptuous green velvet whilst dramatic peak lapels and shawl collars provide additional depth. 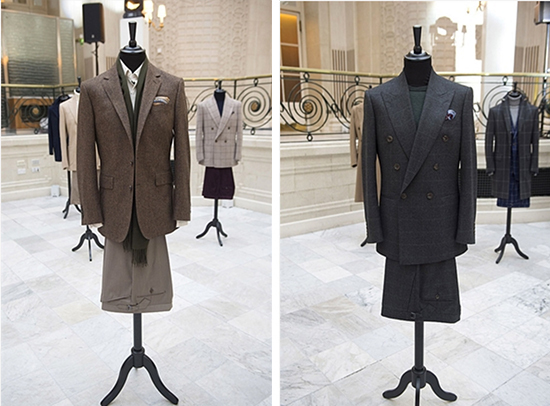 Taking the modern man from day to night, each piece guarantees the wearer will look their very best; be it on the red carpet or in the boardroom this is Savile Row tailoring as you’ve never seen it before. 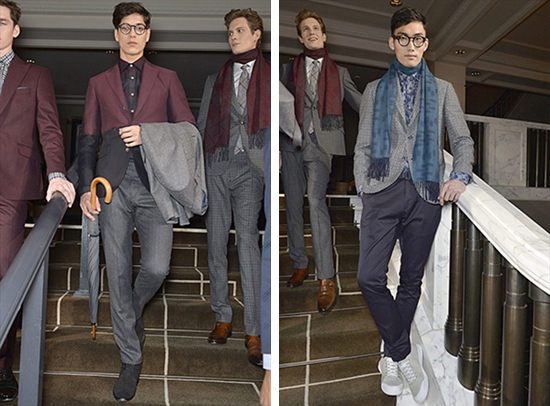 For Chester Barrie, AW16 all about breathing new life into menswear staples as the brand uphold their position as the modern tailor for the modern man. We’ve come to expect nothing less than absolute drama from McQueen, and the AW16 men’s collection handed it to us gladly. Set in stunning surroundings, a live pianist played out into the darkness before the presentation began and atmospheric, deep and dark music filled the room. Gaunt and pale, hollow-cheeked models, complete with safety pin piercings puncturing their faces, drifted down the catwalk in a macabre collection that conjured up imagery of Victorian vampires and darkest fantasies. 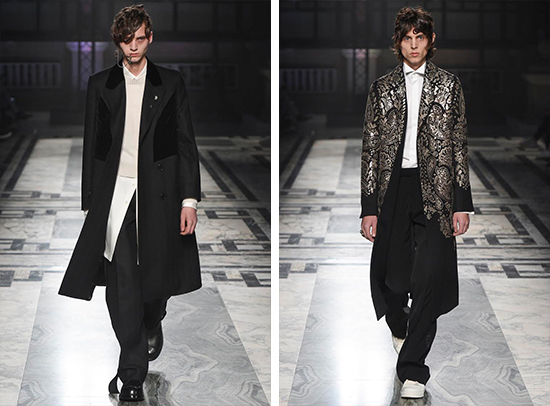 Military and Victorian-inspired silhouettes filled the runway, with theatrical long coats, complete with velvet patchwork, bejewelled embellishments or glitzy brocade, contrasting against the bright white shell-toe trainers they were paired with. Silver metal chains adorned the outfits and the metallic theme weaved in amongst the presentation for a faded Baroque glamour; antique gold sequins in paisley patterns festooned jackets but dissolved away towards the hips, as if they had disintegrated and worn away over time. Neat, sharp shoulders were prevalent, and a romantic butterfly motif occurred time and again throughout the collection. Butterflies and moths were embroidered across camel coats, woven into monochrome skinny-fit suits and made their way onto the lapels of slim officer-style coats, hinting at the Darwinian theme present throughout. Fossils were also drawn onto onto oversize silk, and big, blowsy florals were present on velvet coats and slim suits, again leading us back into the true romance of this collection. A simple colour palette of black, white, camel, oxblood and scarlet dominated, with the hints of silver and gold flashing throughout. A gothic masterpiece, intimating faded romanticism and worn-out beauty, with the bold stroke of drama that we adore from McQueen. It’s been two years since Jeremy Scott was appointed creative director and Moschino, and he’s taken great strides in taking the house to new heights. 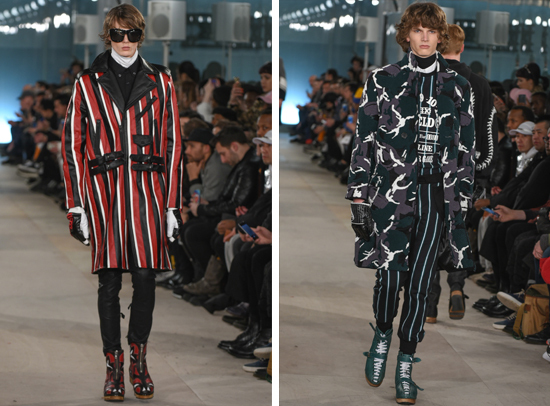 The AW16 men’s collection didn’t disappoint, and may just prove to be one of the weekend’s biggest talking points. 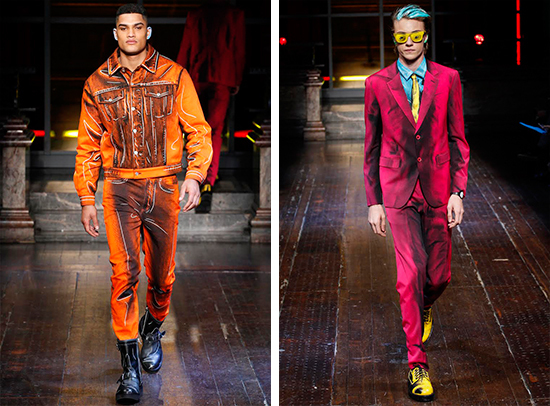 Sending out a collection packed with references to the 1980s, pop art, punk and comic books, Scott’s Moschino was a riot of colour and craziness. Added to the mix was the addition of a flurry of female models too, including Jourdan Dunn and Ruth Bell, presumably in a move to celebrate gender fluidity and freedom. Skinny-fit suits in a blaze of colours, from magenta pink and electric blue to multi-coloured prints, stormed the runway complete with a heavy dusting of black shading and paired with matching sunglasses and contrasting accessories. These looks especially were reminiscent of 80s’ David Bowie and comic-book villains of days gone by, finished with streaks of powdery brights in the hair and residue staining the ears of models. Double denim was taken to new extremes with acid shades and cartoonish whiskers drawn on for a ‘worn-in’ effect, paired with scribbled-on Doc Martens too. Punk vibes were referenced too, with coloured crucifixes adorning oversized bombers and slouchy tees, and pleated half-skirts made to look like checked flannel shirts tied around the waist – all in a riot of acid bright shades, of course. Moschino’s take on AW16 is certainly one we’ll remember – and one the whole team will be shopping at too. 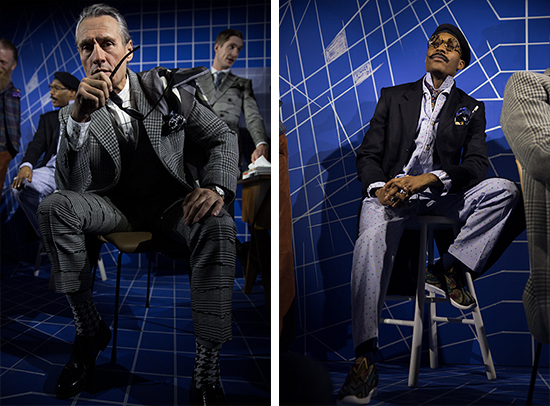 Turning to preeminent literature for inspiration including George Orwell’s ‘1984’, Ayn Rand’s ‘The Fountain Head’ and Robert Louis Stevenson’s ‘The Strange Case of Dr. Jekyll and Mr. Hyde’, for Turnbull & Asser, AW16 centers on two conflicting protagonists; ‘The Artist’ and ‘The Architect’. Despite creating a collection bound by conflictions, the insightful brand has managed to construct a seamlessly balanced aesthetic that skillfully juxtaposes key elements from each of its characters. ‘The Artist’ provides colourful chaos through wild paint stroke jacquards and an eclectic palette of electric indigo and soft magenta whilst ‘The Architect’ deftly mutes its counterpart with schematic motifs in stripped-back monochrome and moody navy. Taking contemporary tailoring to the next level, Turnbull & Asser disregard the homogenous suit in favor of creative flair. KTZ’s Majan Pejowski is of that rare breed of fashion designers who has managed to garner a devoted following that is a subculture in itself. For AW16 he stepped away from his neo gothic aesthetic slightly by injecting it with hard and hevy dose of Americana; the collection was all about American sports and the culture that surrounds them. KTZ collections often ‘follow on’ from previous seasons, showing a stylistic journey as it happens: reflecting and building upon the aesthetics of past collections like SS16 for example which payed an homage to iconic movie the Warriors and the baseball uniforms; the stitching of a baseball was a common denominator on many of the looks shown for Aw16. The signature KTZ icons were replaced with slogans and sports style emblems and bright pageantry colours of American sports teams ran through out; black was present and correct but far less this season, baseball bats and sporting helmets added a sinister aspect that heightened the collections tough and ready aesthetic. What was perhaps most interesting about the collection, given the current polital state of affairs in the US was the seeming and pertinet message the collection gave. Amidst this most excellent exercise in the subversion of American culture, were the militaristic accents applied to many looks; in US Airforce’s shooting star emblem was applied to collars, rendering them similar in look to Nazi uniforms. It was it appeared, comment upon the popular current World view coming out of the US: anti-immigration, Islamaphobia, the power of the ‘Police State’, and the horror of a potential President Trump.. The proud prescence of the Union Jack during the final looks seemed a fitting conclusion, a statement that one place will always remain a bastion of freedom and creativity. Bravo KTZ!